The stunning announcements that Microsoft and Salesforce.com would become more engaged with Oracle by using its middleware, hardware and associated other products has left many people agape and agog and for good reasons. We are all more accustomed to covering the initiation of trends and their evolution than their resolutions. Initiations have terms associated with them and one of the best to have, if you are looking to capture a market, is disruption. It rhymes with eruption and carries a similar but not identical definition. Disruptions change the existing order and eruptions burst forth seemingly from nowhere and you can make the case that really significant events in the technology world do both. The iPhone and iPad erupted, coming out of nowhere, and disrupted the communications and computing markets respectively. The recent announcements by Oracle, Microsoft, and Salesforce.com also erupted and may be disruptive but I think the market is still trying to figure out their meaning. Let me take a stab at it. Yesterday I was musing about the idea of Oracle acquiring Salesforce and uniting it with NetSuite to produce a new enterprise cloud company and while I think that could still happen, I think I may have been thinking too small about the situation. I now believe the import of these announcements is to signal an end of competitive markets in middleware and Linux and the beginning of some others. We can argue about it, but we’ve played out the string long enough in middleware and Linux and in the process Oracle’s products have gotten enough market penetration to become standards. This doesn’t mean that other products will go away but it does mean that everything is fairly homogenized and standardized to the point that it doesn’t matter any more. Exadata is different. It’s not new any longer but it is still very much a disruption. That’s the storage system from Sun that runs lots of spindles and piles on memory so that database operations happen closer to memory speeds than to disk speeds. It’s roughly the difference between milliseconds and nanoseconds — as much as a million times faster. Exadata or something like it is becoming necessary today for cloud data centers running big data and big database systems. 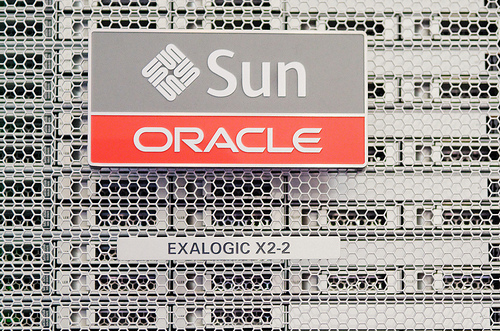 But I expect that Exadata has always suffered from being an Oracle product meaning that customers may have been leery of getting too much Oracle in their datacenters for their own good. If you become a one-vendor shop do you lose some leverage with your supplier? But when Salesforce announced it would use Exadata in its datacenter, it changed the complexion of the discussion. As a cloud platform and application provider, the problem or opportunity of dealing with Oracle becomes Salesforce’s and so provides a level of insulation between the end customer and primary supplier. Will it matter? Quite possibly yes. As one of Oracle’s largest customers, and growing, Salesforce can exert a modicum of influence with Oracle that even a large corporation or government might not. Exadata may also be becoming a necessity in many enterprises as a possible security tool. Unless you have not been reading the papers or this space, you know that industrial espionage through hacking data is a big problem globally with China the leading culprit. Conventional barrier methods of securing data are hardly up to the task of keeping intellectual property secure these days and all signs point to a need to encrypt all, or at least most, sensitive data to make it much less profitable for bad guys to steal secrets and IP. But there is significant overhead attending to encryption especially if it is applied to all enterprise data. Exadata or some generalized version could be effective at enabling enterprises with very large data sets to use more encryption without necessarily imposing a great burden on the gear or the corporate coffers. Salesforce’s embrace of Exadata brings it dramatically to the cloud and offers at least the possibility of making the cloud more secure than older terrestrial datacenters. We’re witnessing the eruption of a new enterprise IT model. It has been birthing for over a decade first with cloud technologies and their predecessors and more recently with the ubiquitous computing models coming into view thanks to all the mobile devices now crowding the market and the social revolution that rides on them. So the recent announcements should not be seen as a pure consolidation or the end of competition. But they are moving the arena of competition from the lower ends of the stack to applications and customers. The competition will likely be much more retail oriented in the future and I expect that will suit the new customers, the millennials, just fine.